This testimonial was given by Gov. Hashimoto on August 8th, 2007. 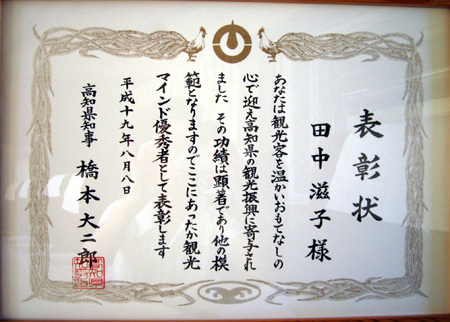 It was presented on the recommendation of the Kochi Sightseeing Association for recognition of the long standing contribution to the city of Kochi of lighting Kochi Castle. On this date, I felt very honored to receive this testimonial during the Otemon Light Up Ceremony as seen on the left. 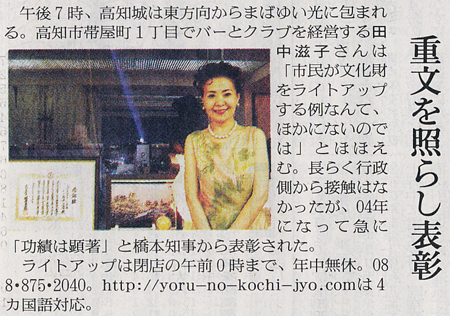 Your heartwarming welcome to tourists contributed to the promotion of Kochi sightseeing. Your contribution is remarkable and should be a model so that is why you are being presented with this testimonial. You are an excellent person with a heartfelt mind towards tourism. The testimonial was given by Gov. 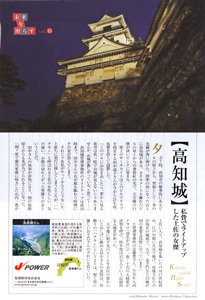 Hashimoto on March 20, 2004 for the lighting up of Kochi Castle which is a sightseeing symbol of Kochi Prefecture, and for showing its elegant outline to tourists in Kochi. It kept on glowing and became a town’s symbol―. There is a certain person who set up a searchlight on the roof of a building at 1-chome, Obiyamachi, Kochi City and has been illuminating the tower of Kochi Castle since 1987. 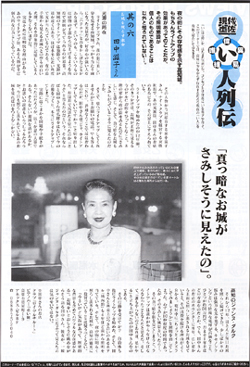 That is Ms Shigeko Tanaka (58) who runs a piano bar and a nightclub on the 8th floor of the building. 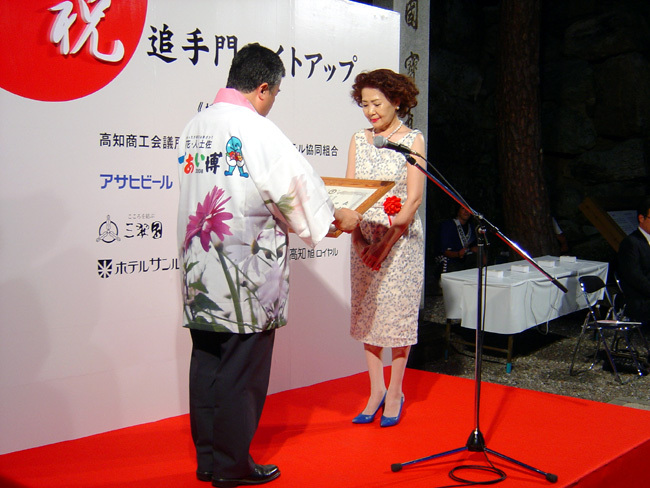 On the 20th, when the ceremony of lighting lanterns of Kochi Castle was held, Governor Daijiro Hashimoto gave Ms Tanaka a testimonial to reward her service of 16 years at Kochi Castle Katitokukan. It was in October 1987 when Ms Tanaka started her business at the present location. She was expectant, thinking “The castle seen from the window must be glowing and beautiful.” However, the administrative office of Kochi Castle stopped lighting up the castle around 1995 to save energy. 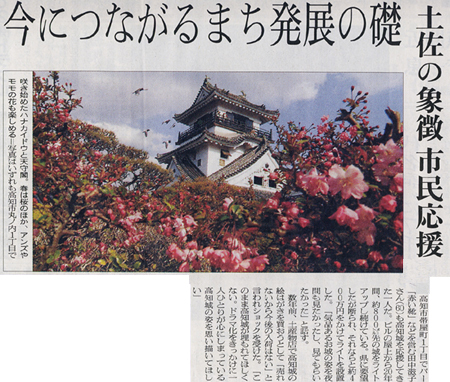 Ms Tanaka, who has loved the view of Kochi Castle since childhood, became determined. “The castle is a symbol of warm southern Kochi, isn’t it? Then I will illuminate it myself.” Within the year she had set up a searchlight on the roof of the building by spending some million yen. Since then for more than 16 years she has been lighting up the castle from evening to around midnight when she closes her bar. Beautiful Kochi Castle, illuminated and soaring above the town at night, is a usual view for us now but curious people must have wondered “How?” Things are usually illuminated upward from a lower position. However, Kochi Castle is lit up in a unique way. It is lit, almost horizontally, by a distant light source. Quite a few people should remember the pale light impressively stretching from Ohte Street to the castle. Actually there is an obvious reason for it. The lighting up has been achieved by the semi-personal effort of one particular individual. This person is Ms Shigeko Tanaka. Ms Tanaka is an entrepreneur who runs a nightclub and the light source is set on the roof of the building where her club is. It was 12 years ago, when she moved her nightclub to the present building, that she started illuminating the castle. “Every time I looked at the night town from the window of my nightclub on the 8th floor where the castle could be seen straight ahead, I felt something was missing and that the dark castle was lonely,” she recalls. Thereupon she telephoned and asked the prefecture to light up the castle, but the answer was “No”. Usually the story would end here but then she broached the question, “May I illuminate the castle?” Whether they thought she was joking or not, they answered, “Please, go ahead.” She consequently used her own money to set up the equipment and realize her idea by starting to light up the castle. In fact, there may have been small problems and formalities, but this is the gist of the story I heard. I understand some people might think it rather ridiculous, but if they were to see the castle being illuminated, even tonight, they would be left speechless. Since then Ms Tanaka has been lighting up the castle almost every day for the past 12 years. Now what bothers her a little is that the xenon arc lamp, a special light bulb which emits strong beam, is expensive. One xenon arc costs approx. \500,000 ($4300) and its life span is only about a year and a half. However, when I sit at the counter of Ms Tanaka’s nightclub and look out at the illuminated castle ahead of me through a large window, I can understand why she continues to do so at her own expense. During the interview, she said, “May I show you a trick?” and turned off the light. It was only for about ten seconds, but how could I explain the dreary landscape I saw? When I saw the dark town, it seemed to me that lighting up the castle was something that one of us had to do. “If nobody does it, I will.” It was Ms Tanaka who rose to the occasion with determination. 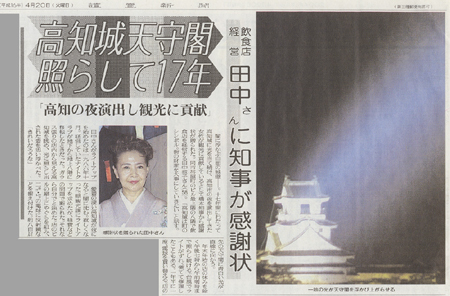 In response to her action, the prefectural government also started to light up the castle. Moreover, Hotel Joseikan, which has a business relationship with Ms Tanaka’s nightclub, also began lighting up the castle about four years ago. Now Kochi Castle, glowing in the night town, undoubtedly fills the important role of increasing tourism in Kochi. “Kochi Castle is not a big castle, but it is graceful, and together with its historical background it has a powerful presence,” says Ms Tanaka, looking at the castle affectionately. It was not my imagination that for a moment I saw a vision of Jeanne d’Arc. 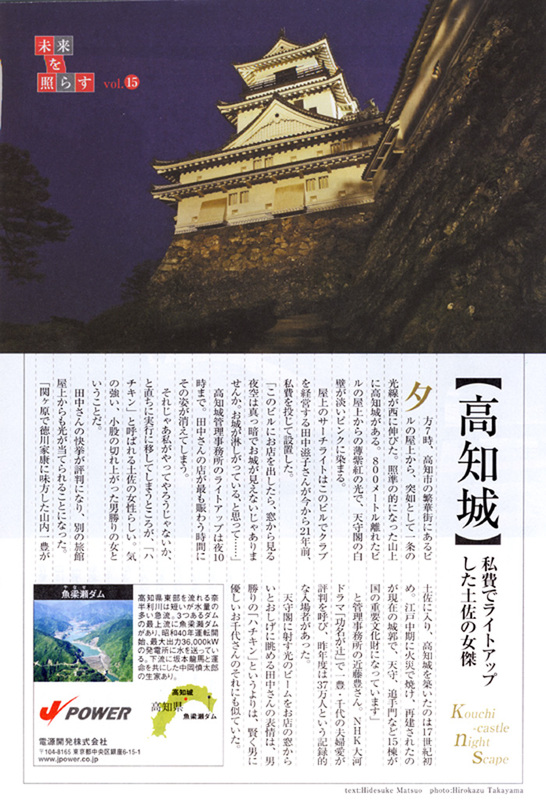 My illumination of Kochi Castle was reported in newspapers, magazines, and on various TV programs. I also received a testimonial from the Governor of Kochi Prefecture. 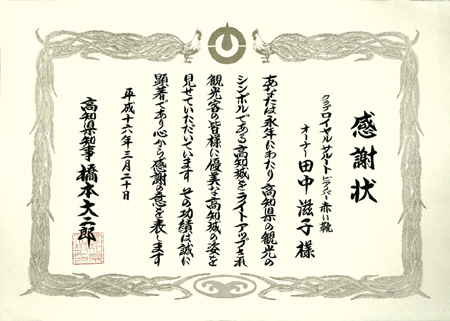 Copyright © 2006-2007 夜の高知城ライトアップクラブ All Rights Reserved.